Robust welded and galvanised steel frames. Replaceable rotationally moulded seamless plastic liner. Optional top inlets and bottom outlets. Liner cone outlets of 60°, 90° and 120°. 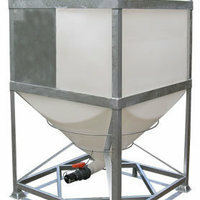 Capacities from 500 – 2250 litres. The DGL is a reusable IBC designed primarily for the transportation and storage of viscous liquids. The DGL liner is rotationally moulded in natural coloured UV stabilised linear medium density polyethylene. The polymer provides strong resistance to industrial wear and tear. The liner has a conical base to enable total draining of the contents. It is supported and protected by a galvanised mild steel frame providing excellent resistance to the elements. The units are interstackable for loading and space saving and have integral four way fork truck entry with anti-tilts to improve handling safety and efficiency. The liner inlet is a 350mm HDPE4 screw cap fitted with an EPDM² O-ring seal. The outlet is a 50mm fusion welded socket to a single union UPVC3 ball valve fitted with EPDM² seals. It is attached to the liner via a fusion welded 50mm BSP male threaded socket. A 50mm BSP female threaded end on each side of the valve terminates in a 50mm male camlock adaptor and dustcap. The dustcap acts as a secondary closure and is secured to the outlet via a cable. 460 mm clamp band lid, 460 mm arag lid. Various valves / seals, including viton. Fusion welded HDPE4 flanged outlets are available for connecting stainless steel butterfly valves. Full fork tunnels on frame (maximum handling stability). Venting / anti-vac / pressure relief. Dimensions subject to normal manufacturing tolerances. More details on the options outlined below can be found by clicking on the Downloads tab and selecting the pdf you require. Please complete the form below if you would like to enquire about the DGL.